Essential oils, it came all the rage lately, but with good reasons. They are, in a sense have a therapeutic effect with incredible power. You would find a number of essential oils and each is famous for its unique offering. These are mainly used for aromatherapy, body or skin care, and a number of personal needs. It is also a nice and appealing way to welcome the guests to your place, and works as a perfect mood setter for an extraordinary evening as well. However, most of us know a little bit about the essential oil diffuser that avail us the benefits of these essential oils. 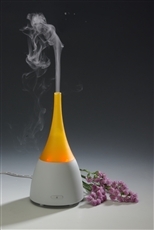 It is always good to release the essential oils through an oil diffuser, even it is one of the great ways to get the therapeutic effects in an economical way. It helps break the oil into small nontoxic particles that spread into the air where you could feel and inhale them. It not only makes your living space smell amazingly good, but also cleanse the bacteria present in the air while reducing stress level, improving concentration and boosting your mood! It’s no wonder that most serene places like yoga centers and spa rooms often make use of oil diffusers to create a peaceful environment. If you have been to these places, then you might have felt the soothing effects by yourself. Ultrasonic: It releases the oil as a part of a fine mist that enhances the moisture level in the air and is ideal for the drier climates that irritate people’s lungs. It's very economical as it requires only a small amount of oil along with the water to give the soothing effect. Evaporative: It follows the natural evaporative process that includes blowing of air onto the oil with the help of a fan. It offers comparatively less therapeutic effect as different ingredient of the oil evaporate at different rates. Heat:It uses an open flame, generally a candle to release the oil and shares the same mechanism as the evaporative oil diffusers. It is very quiet, economical, and readily available. Literally, the essential oils are the best things that plant produce, and it plays a vital role in combating deadly bacteria, fungi, and viruses. The users are less likely to face infectious diseases and recover faster than the antibiotic users. That's the reason it is very important for a healthy and prosperous living. So, get the right diffuser to avail with most of the benefits of essential oils.